The Philippine island of Bohol was rocked last week by a magnitude 7.2 Earthquake. In its wake, a spectacular, 10-foot-tall rocky wall has emerged, cutting through at least 3 miles (5 km) of farmland. 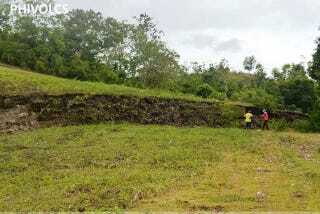 All photos via Philippine Institute of Volcanology and Seismology. The ground rupture lifted a stretch of land by up to 10 feet (3 m) at some points, creating a wall of rock and soil along the fault line and just above the epicentre. "Our people have walked five kilometres (three miles) so far and not found the end of this wall," [said Maria Isabel Abigania, a geologist at the Philippine Institute of Volcanology and Seismology], as experts from the institute surveyed the damage. "So far we have not gotten any reports of people getting swallowed up in these cracks. The fault runs along a less-populated area." A photograph on the institute's website showed part of the rock wall grotesquely rising on farmland behind an unscathed bamboo hut.